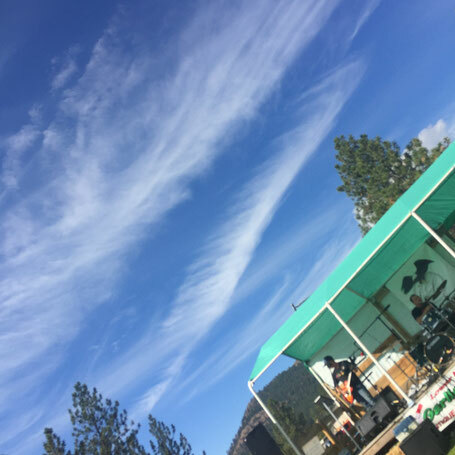 We live in Bluebird Country, an artistic and musical expression created to be a part of, and help realize an inspired vision, Route Blue, happening in interior BC. An initiative right up Meme Dream's alley! Route Blue is a "borderless connection based experience". Connecting rural communities through art and music. And adding a digital element. Our highway systems connect us in a real way. Road trips! Michelle Loughery’s vision of Route Blue is like a metaphorical system of pathways that we ground in a real sense whenever any of us creates a touchstone along it. Like our Bluebird Coffee House, or the volunteers like Susan Roline and Mary Dickie, keeping the doors open at CMHF, or Bobby Garcia’s “That’s Country”, his song written about Merritt. Michelle’s Murals in different communities, and her continued focus on the art and music created out of our stories, gives life to Route Blue. And any of us who want to connect to each other along the route she is envisioning, has opportunities like creating music and community art (bouy painting!) and bringing to a common experience our own local flavor. Michelle and others see this Nicola Valley community as music based, perhaps country music based, one of its possible expressions, and have worked to give that focus a home, like the CMHF, our music festivals, and all the music playing in venues around the valley. As individual, or groups, or as a whole community, we have the potential to fill out these visions and support the work that others have done. And each of us can bring our own expression to it. We can collaborate. Michelle uses a vocabulary of possibility and connection. She talks about the stories of our lives, stories that connect us and differentiate us. Her work is a big vision of expression and connection, hope and fun. In our free flow discussions, the bluebird stands for the music in our valley, and connects with us with music across borders. Each of us can choose how we express the connection we feel, and how we want to create touchstones for people to connect to. Our Coffee Houses, put on by our Coffee House Crew as we call ourselves, is our way of bringing local musicians together with music lovers and enjoy a beautiful venue in the CMHF. There are other possibilities for music…Melvina’s Desert Inn, the Adelphi, and now our Open Mic Nights at the Kekuli café, which is a great collaboration between Jeremy Ball, a musician with a vision, Sharon Bondhogg at Kekuli, a successful entrepreneurial venture, and the Nicola Valley Arts Council, a current going concern. All of these ventures are seeking to get others involved in expressing themselves and encouraging others’ visions. I am inspired by community activists Mischelle Pierce, Jackie Stibbards, Denise Kearney, Jean Kiegerl, and recently, the longtime Merritt artist Bev Veale, all who see community as a place of action, connection, and expression. And I run across more each day. I have worked alongside the First Nations all my life, and shared a love of the land and respect for one another. We connect, we collaborate, we express ourselves and our own visions. And create visions larger than ourselves. Community collaborations. Synergy. It’s magnetic. A possible vortex of creativity with a still centre of inspiration. Route Blue is a real vision of all of these avenues, pathways, roadways of expression and connection. Bringing our best selves forward. And creating a safe space of acceptance and inspiration for each other. My touchstones with others: CMHF, NVAC, Bluebird Coffee House, my collaboration with my partner Gord Cockle who connected people for years through his writing in the local papers and his attention to storytelling. The inspiration I get from my own children. Bluebird Country... sharing stories along Route Blue in a "borderless connection based experience". Storytelling through photos, art, music, drama, comedy. Thanks to the singers, musicians, artists, educators, entrepreneurs, businesses…you name it. I'm off to add Michelle Loughery to lawolf 's long list!